BANGI, 4 March 2014 – Employers look for people who have high integrity, good inter-personel skills and be willing to work in a team rather than those with mere academic excellence. 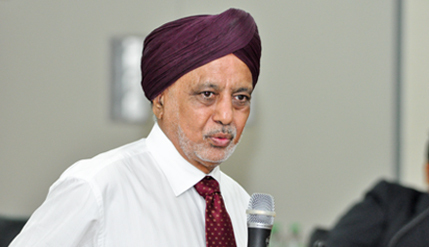 Speaking at the Malaysian Youth Leadership Conference at The National University of Malaysia (UKM) here today, motivational speaker Dr Ranjit Singh Malhi said employers are looking for people who have personal competence and thinking skills. Having excellent academic results may secure a job interview but companies are searching for workers who are truthful and honest about the way they work and deal with other employees. He said a person must own a set of competencies consisting of knowledge and soft-skills in order to remain employable. However, employers nowadays prefer hiring graduates who possess admirable soft-skills compared to just excellent academic background. Dr Ranjit, a Senior Corporate Fellow of the Asia E-University gave the insight on the main attributes that employers today seek in hiring graduates for any job openings to about 100 university and secondary school students attending the conference. He said soft-skills are needed by graduates to enhance their employability explaining that soft-skills consisted of three elements; personal competence, thinking skills and interpersonal competence. Integrity, critical thinking and leadership quality are among the 15 attributes under the three soft-skills’ elements, said Dr Ranjit who wrote the books Make Yourself Employable and Your Dream Job. He said integrity was found to be the most admirable soft-skills attribute employers seek in their future employees. Based on a study, employers prefer their employees to possess “much more than honesty” attitude compared to other interpersonal qualities, he said. The second most admired attributes was their willingness to learn followed by communication skills. Surprisingly creativity and leadership qualities were the least attributes that employers seek when hiring graduates, he said. The conference was jointly organised by UKM and the Cheras Education Foundation (Yayasan Pendidikan Cheras).